Sunday was a special day for professional sports in Kansas City, but some fans went above and beyond. KANSAS CITY, Mo. — Sunday was a special day for professional sports in Kansas City, but some fans went above and beyond. 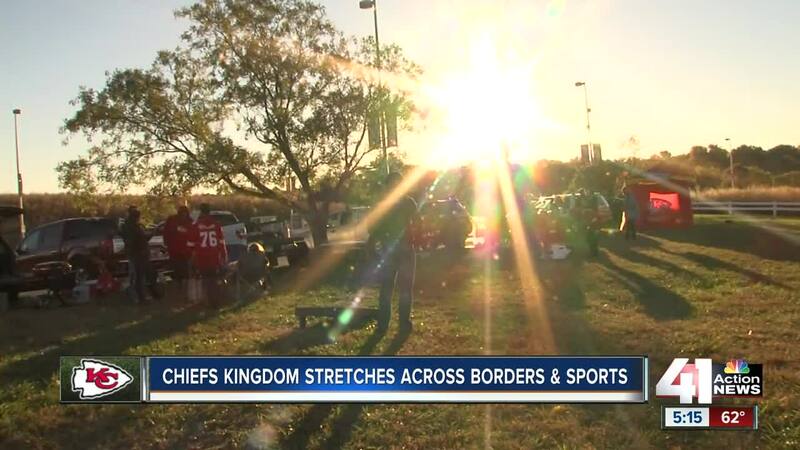 It started with the Chiefs' 30-23 victory against the AFC West rivals at Arrowhead Stadium and continued 23 miles away at Children's Mercy Park, where Sporting Kansas City won the Western Conference title with a 2-1 victory versus LAFC. For some fans — like Barry and Stewart Janzen brothers, who are Chiefs season ticket holders from Canada — the commitment was a bit more extreme. The Janzens' love for the Chiefs started 15 years ago. "My brother said, 'I started watching NFL lately,'" Barry said. "I said, 'Same here.' He said, 'I've been following the Chiefs.'" The brothers decided to come to Arrowhead for a game and were instantly hooked. "Before the game started, when they sang the anthem — 'and the home of the ...' — when they screamed Chiefs, we just got the shivers and thought, 'Yeah, this is for us,'" Barry said. For this weekend's showdown, the Janzens brought two friends, including one who had never been to Missouri before. They hit up several favorite local spots, including Q39 for dinner, on Saturday night. Some people might think driving 12 hours for every Chiefs home game is crazy, but Barry said the trip to Kansas City is always worth it. "It's just a Midwestern town that everybody gets along," he said. "No one takes anyone too seriously. It's not so New York or LA kind of a cool, trying too hard. It's just normal folks her." Not far from the Janzen brothers' tailgate, Brandon Barelmann also started his day at Arrowhead. It just didn't end there. "At halftime, I'm dipping out," he said. "I'm going to (Children's Mercy) Park. I'll be sitting in probably M6. I'm hoping in the Caldron, standing and cheering the whole time." Attending the unique doubleheader certainly made Barrelmann stand out on a terrific day for local sports fans. "It's maybe crazy, but it's a job that I have as a season ticket holder for both," he said. "Like, it's not really a choice. I have to do it, especially with so much on the line."